Magnetic Pain Relief offers a safe, and natural method of therapy, by applying positive magnetic fields to the body to accelerate the natural healing process, provide natural pain relief, arthritis pain relief and improve sleep. The idea of magnetic pain relief or magnetic therapy is centuries old - it was actively employed by medical doctors in America in the 1800's and early 1900's and magnetic therapy has long been used as an effective healing tool in China, France, India and Japan, especially in repairing soft-tissue injuries. There are even stories that famous people in history such as Cleopatra wore magnetic bracelets and necklaces for healing. Magnets are a healing tool, they do not heal by themselves. Science knows that the human body is composed of numerous cells that combine to form blood, tissues, bones and organs. These cells are in the constant state of renewing themselves. When our environment is in balance, our bodies react normally and cells renew themselves normally. Because of negative magnetic fields in our environment, created by radios, computers, cell phones, and other electronic equipment, our environments are not balanced. This affects our bodies, our cells and our every day health. Magnetic Pain Relief jewelry works with your own metabolism, through your circulatory system. The positive magnetic field our jewelry creates, increases the oxygenation of your blood, increases your energy and your circulation and thus speeds your healing, reduces your pain and inflammation, reduces your stress and assists in removal of toxins from your body. Basically, you just feel healthier! Our jewelry does not contain magnets, but rather, is made of a magnetic stone called Lodestone, commonly referred to as Magnetic Hematite. The beads created from this naturally magnetic stone are refined to an even strength of magnetism, in order to create an even flowing positive magnetic field. Each stone we use has been carefully manufactured and tested. And each piece of jewelry we create, is 100% customizable to your style! Our jewelry is safe to use and starts working as soon as you touch it. Many feel a difference within 48 hours if not immediately. Some people do take a bit of time to notice a change, because of differences in body structure. Listen to your body, it will tell you! In April, 2011 I saw a specialist about thyroid problems. One lump had calcified but several other lumps were still filled with fluid. After biopsies, I was informed that pre-cancerous cells were found. Apparently I have had some lumps for 30 years and didn’t realize it. Because of the slow growth of thyroid cancer, my specialist said nothing would be done unless the pre-cancerous cells increased or cancer cells were definitely identified. I would have to be tested every 6 months. There is no cure other than surgery. In June 2011, as soon as I started wearing my magnetic necklace and anklet, my thyroid area started to pain, or hurt, or felt like I was holding a ball under my chin. This happened once a week in the beginning but escalated to several times a week and even in bed. I wouldn’t take off the necklace because it helped me sleep. I had an ultrasound last week and saw my specialist yesterday. My lump has shrunk to less than half its size in 7 months. The doctor said I didn’t have to worry about cancer anymore and didn’t have to have any more tests or ultrasounds. He said this was rare and it wasn’t very often that he could tell someone they were cured. That was such good news. I had been quite worried because I though the lump must be getting larger and that I would require surgery. I credit this to the magnetic necklace. Even the specialist said it was me who caused the change. 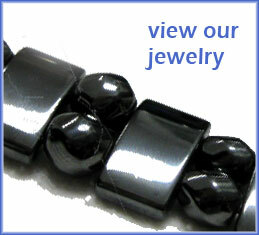 Wearing magnetic jewellery helps clear the body’s blocked energy paths (5) so the whole body functions more efficiently. I believe the pain in my thyroid was caused by the blockage of a pathway and the energy flow attempting to travel that path without success. I bought the magnetic jewelry and within a few days I had no pain anywhere. I would not be able to work out in my gardens if it were not for the bracelets! I have been wearing magnetic jewelry for about five months now and the difference in my neck is amazing.Soon after putting it on, my shoulders felt alot better. It took about a month before I saw a big change in my neck. It used to be a daily struggle to try and get relief from the pain. I tried everything: hot pads, special pillows, acupuncture, chiropractors and even anti-inflammitories, but they were only temporary. I do not know how they work, but I know I am sure happy that I wear them and I am not planning on taking them off! I am 88 years old. I worked hard all my life. My hands were full of arthritis and my shoulders and legs were always in pain. I bought three pieces of magnetic jewelry and I feel great now! I started wearing a necklace in January 2006 because I have very bad pain in my back and down my legs. I had a back operation about 19 years ago but certain things I would do would still cause pain. Now, since wearing the jewelry, I can do alot more then I used to. It was about a month before I noticed the greatest amount of difference, but I do know it is working well for me. Please Email us if you have any concerns or questions, or you can download a copy of Magnetic Pain Relief Information or our Frequently Asked Questions. Magnets are not meant to be used with pacemakers or automatic internal defibrillators or during pregnancy, unless approved by a licensed physician. Keep all Magnetic Pain Relief devices at least 18 inches away from any battery operated medical device, such as but not limited to, pacemakers, computers, insulin pumps or automatic defibrillators. Persons with mental disorders, those on a current therapy routine, or those that are being medically treated should consult a licensed physician before changing their routine or treatment or wearing our products.